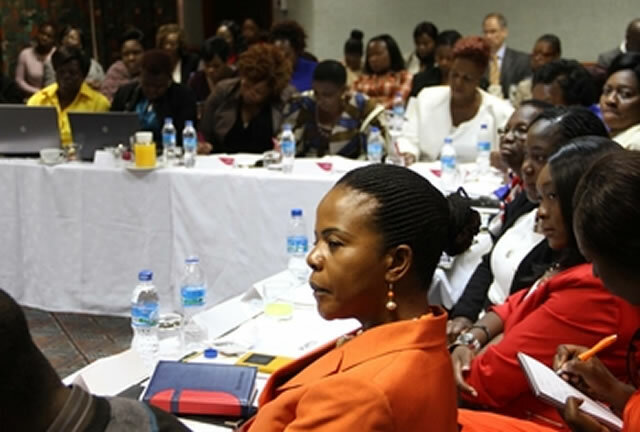 Male politicians from various parties demand sexual favours from aspiring female Parliamentarians as a condition for them to qualify for primary elections or get support for their campaigns, it has been alleged.Female politicians said this at a workshop organised by The Women’s Trust and the Research and Advocacy Unit in Harare yesterday. Women politicians were speaking on their experiences during the last elections and strategies in place to create a more gender sensitive playing field ahead of the next polls. Women MPs and their losing counterparts in the July 31 harmonised elections from Zanu-PF, MDC-T and MDC said they were subjected to sexual harassment because they did not have adequate resources to fund their elections, while violence was also used against them. “There was violence against aspiring (female) candidates. They were beaten up so that they would stay at home. But if you were not beaten up, you would be sexually harassed, which is an abuse of women into office,” said Mutare South MP Cde Nyasha Chikwinya (Zanu-PF). She alleged rigging against women during primary elections. Cde Chikwinya said women had less media coverage than men during campaigning, and that male politicians also engaged in vote-buying. Young female MPs and politicians said they faced sexual exploitation from men when fundraising for primary elections. Ms Maureen Kademaunga, who spoke on behalf of young women in politics, said some pulled out of primary elections because of sexual harassment by senior male party gurus. Ms Kademaunga was nominated under MDC-T’s women’s quota for Mashonaland East but did not make it into Parliament because her party did not get sufficient votes. “When we tried to go out and fund-raise in the constituency, it was a challenge because even local businesspeople do not have confidence in the leadership of women generally,” she said. “When we went out to fund-raise, it’s either you would not succeed or since men have money they would get an opportunity to sexually exploit us. So sexual exploitation is what we were running from. MDC-T legislator for Harare West Ms Jessie Majome said the new Constitution had several provisions promoting gender equality and women’s general upliftment. “Women are the highest beneficiaries of this Constitution. While we may have this Constitution, the reality of life continues as it was. But this document will take us to Constitutional heaven . . . We are not using this Constitution. We need to conduct civic education so that women out there may understand this Constitution,” said Ms Majome. She said some of the positives in the Constitution included recognition of equality, anti-discrimination, equal citizenship, rights of women, and rights to sexual reproductive health among others. Zanu-PF senator for Manicaland and Women’s parliamentary caucus chairperson Cde Monica Mutsvangwa said women earned their positions in politics because they participated side-by-side with their male counterparts during the liberation struggle.